It has been a while since Max Decals had done anything in 1/72 scale and I have to say that the wait has well been worth it. This particular sheet has seventeen markings options. Yep you read that right and it covers a wide variety of types from the inception of the Irish Air Corps, though WWII and into the early 1950s. No jets in this one and some very interesting aircraft types. Thanks to some new kit releases and some short run stuff, there is at least one kit available for each of the markings options provided. As you might guess, the cover sheet does not show all of what you can build from this one, so I'll get right into listing what is there. Moving to the later period is a DH.84 in both mid-green and with a camouflaged fuselage. A Grunau Baby II glider is also included on the sheet. Getting closer to WWII is an Anson I with the green fuselage and a silver Walrus I. Both of these are also provided later on with camouflage and there are two other options for the Anson. In camo over silver is a Hawker Hind, a Hawker Hector, and a Gladiator. This latter aircraft is also shown with a green fuselage. The Lysander on the sheet is both in camo and overall silver. Post war there is a Battle target tug from 1945 in camo along with a Hurricane II. A Martinet TT is in overall silver and the Seafire in a pale green. This green shade is somewhat elusive, but there are several possible options provided in the instruction. 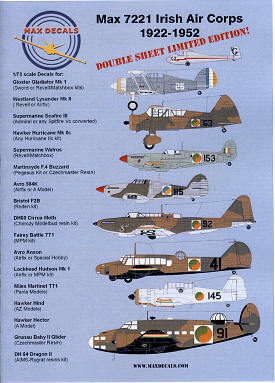 The two sheets of decals are superbly printed and the second sheet offers a variety of roundels and wing stripes as well as some rudder stripe markings. On this second sheet are the PC.10 Brisfit markings; these being sized for the Wingnut Wings 1/32 sheet. Review sheet courtesy of Max Decals. 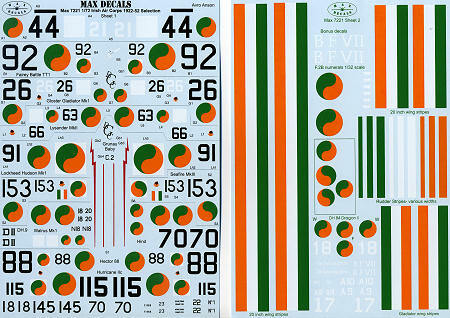 Please visit them at www.maxdecals.com. You can also order sheets if they are unavailable at your local hobby shop.